A study estimating total usable groundwater storage in India reveals high rates of depletion of groundwater storage in north-east India (Assam), despite an increase in rainfall. Researchers warn of impending droughts and famines in flood-prone Assam linked to the overexploitation of usable groundwater stock by pumping for irrigation. Estimates show rapid exhaustion of usable groundwater storage during the study period (2003-2015) in Assam, Punjab, Haryana, Uttar Pradesh, Bihar and West Bengal. States with the highest groundwater depletion rates are subjected to water-intensive cropping practices during the study period. Researchers warn of impending droughts and famines in flood-prone Assam, linked to the overexploitation of usable groundwater by irrigation-associated pumping. A study that examined the status of the stock of groundwater available for extraction across the country revealed that Assam has lost the maximum amount of usable groundwater stock (between 2003 to 2015) in India. “It is well-known that western India is living beyond its means when it comes to this resource. 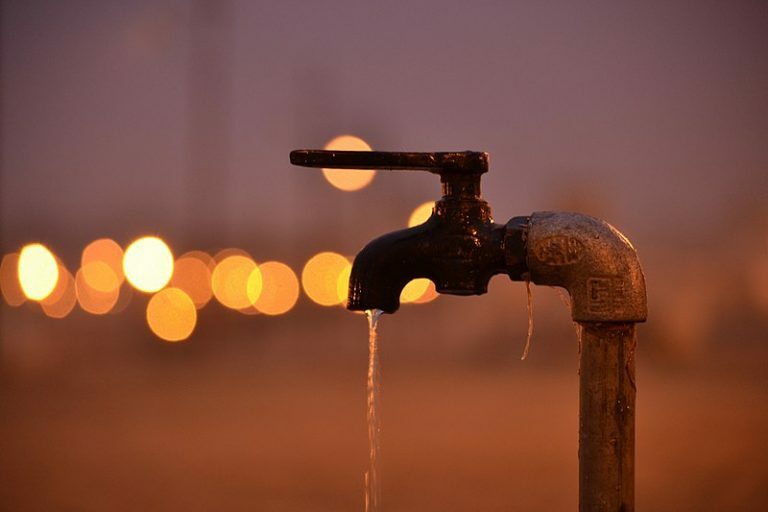 But our study shows that Assam and east India which were considered ‘water-affluent’ are experiencing loss in usable groundwater volume at a rate faster than it can be replenished,” lead researcher Abhijit Mukherjee of Indian Institute of Technology, Kharagpur told Mongabay-India. The study combined borehole data from Central Ground Water Board, rainfall data and satellite data from NASA’s Gravity Recovery and Climate Experiment (GRACE), a pair of satellites launched in 2002. It showed Assam lost two percent of the groundwater stock (up to a maximum aquifer depth of 300 metres) that could have been used. “Subsequently, many of these states are now intermittently getting affected by ‘groundwater drought’ in recent summers. Our prediction suggests that these summer groundwater droughts would intensify in recent future years, to become severe to very severe by 2050, with the possibility of spread over all seasons,” said Mukherjee in a statement. States and locations of wells where groundwater observations were made in the study area in India. Map by study authors. Mukherjee, of IIT Kharagpur’s Applied Policy Advisory for Hydrogeoscience (APAH) Group, contends these groundwater droughts would accelerate the decline in food production and availability of drinking water, two of the prime goals under the UN Sustainable Development Goals 2030. Overall, the estimates show rapid exhaustion of usable groundwater storage during 2005-2013 in Assam, Punjab, Haryana, Uttar Pradesh, Bihar and West Bengal. “In these areas, agricultural food production has been enhanced at the expense of a non-renewable loss in groundwater volume at an alarming rate,” said co-author Soumendra Bhanja. In addition, the zones that exhibited maximum depletion of groundwater spanned across states located in the Indus, Ganga and Brahmaputra basins that have water-bearing, highly fertile alluvial formations lending themselves to groundwater withdrawal for agriculture. “In eastern India, we have seen a major shift in the last 10 years in terms of enhanced irrigation potential of areas. For Assam which had two crops a year, we are seeing three to four crops annually now,” said Mukherjee. In states such as Assam, Rajasthan and Uttar Pradesh, water-intensive crops such as rice, wheat, sugarcane, fruits and vegetables, cotton and soybean, take up the majority of the cropped area. Annual irrigated area for six water-intensive crops for Rajasthan, Assam and Uttar Pradesh. Illustration by study authors. In fact, the cropped area associated with the two most water-intensive crops (rice and cotton) rapidly expanded during the study period, the researchers note. “Rice and sugarcane are water-guzzlers. Even parched states like Haryana and Punjab are growing rice and both account for more than 60 percent of basmati exports from the country,” said Bhanja. Vimal Mishra, associate professor at the Indian Institute of Technology (IIT) Gandhinagar, who was not associated with the study, found the major findings from the IIT-Kharagpur study to be consistent with his team’s previous studies that show a depletion of groundwater in the majority of north India. “The groundwater depletion in north India is the result of intensive pumping, long-term decline in precipitation, and decline in low-intensity rainy days. This is another study that reminds us that we need to do much more to ensure groundwater sustainability in India which is the key for food and fresh water security” Mishra told Mongabay-India. 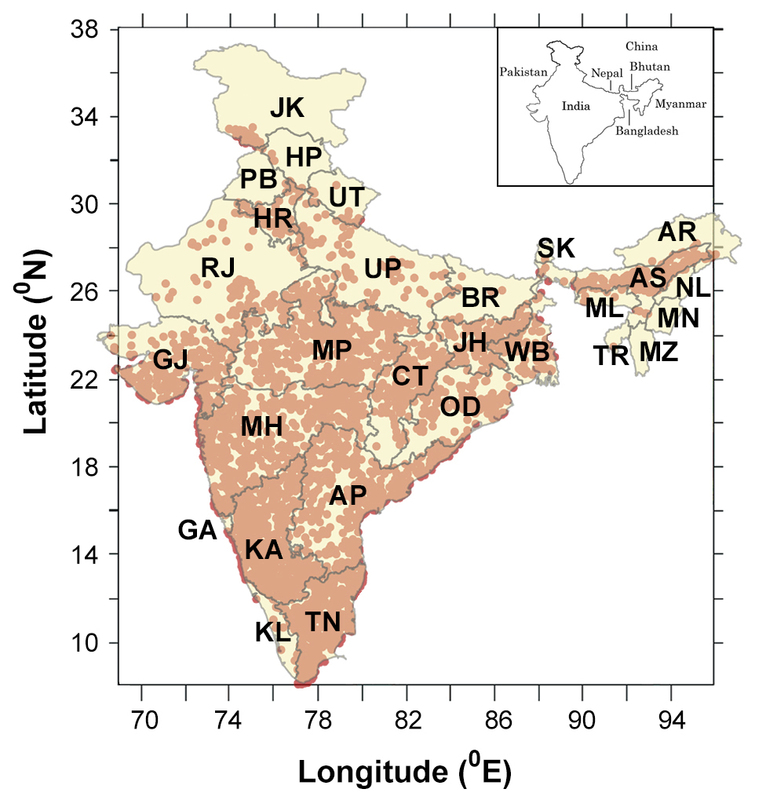 Mishra and his team run and manage India’s real-time drought early-warning system. The latest data has revealed that 42 percent of India is facing drought with more than 16 percent under severe drought. International non-government organisation WaterAid in its report released in March said global groundwater depletion has increased by 22 percent in the past decade, largely due to rising demand in India (23 percent), China (102 percent) and the United States (31 percent). India is the third largest exporter of groundwater – 12 percent of the global total – and also uses the largest amount of groundwater – 24 percent of the global total. One billion people in the country live in water-scarce areas. The report stressed food and crop exports, while important sources of income for most countries, contribute to this problem if production is not sustainable. “Industrial and agricultural use of water should not be prioritised over people’s ability to get water daily for their basic needs,” the report said. India is the third largest exporter of groundwater in the world and also uses the largest amount of groundwater. Photo by PavitraKBRao/Wikimedia Commons. Assam, the researchers said, is a study in contrasts. Trends point to increasing rainfall during the study period in the state while recording the “highest depletion potential” of usable groundwater storage (UGWS) in India, said Mukherjee. During the study period, the net irrigated area (using tubewells) jumped from 9,000 hectares to 74,000 hectares in the state. In a decade the state lost more than two percent of usable groundwater, said Mukherjee. “But the excess water from the rainfall and floods does not get translated into groundwater because of the geology and the physics. If you think of mopping up a water spill with a sponge, then you would notice that initially, the sponge soaks up a lot of water but on subsequent use, it won’t take up any more water despite the fact that there is space inside,” pointed out Mukherjee. A similar scenario is unfolding in Assam, he said. “Once the top layer gets saturated, water does not trickle down to the subsurface for storage even though there is capacity for storage,” Mukherjee said. Haryana, like Assam, showed a similar pattern: increase in precipitation but depletion in groundwater storage. A climate projection for the period 2021-2050 highlighted in the Assam State Action Plan on Climate Change forecasts only the western part of the state will experience a slight decrease in rainfall but the rest of Assam is projected to have increased rainfall. Assam and parts of east India are already saddled with problems of arsenic contamination of groundwater while parts of southern and western India battle the scourge of fluoride contamination. Salinity is a cause of concern in many parts of northwestern, western and southern India. Despite the grim picture, the study also underscores the positives. For groundwater rejuvenation efforts, states like Andhra Pradesh and Jharkhand show the highest potential. “Because of the geology, these two states are highly receptive to groundwater restoration efforts. Overall, Andhra Pradesh, Maharashtra, Gujarat, Tamil Nadu and Chhattisgarh show a replenishing trend during the study period,” he said. Mukherjee explained investigating estimates of usable groundwater storage across India could inform policy for budgeting water. “Our estimates are conservative and close to reality. We could possibly do a pricing and budgeting mechanism and start allocating water for agriculture depending on the groundwater depletion potential,” he added. 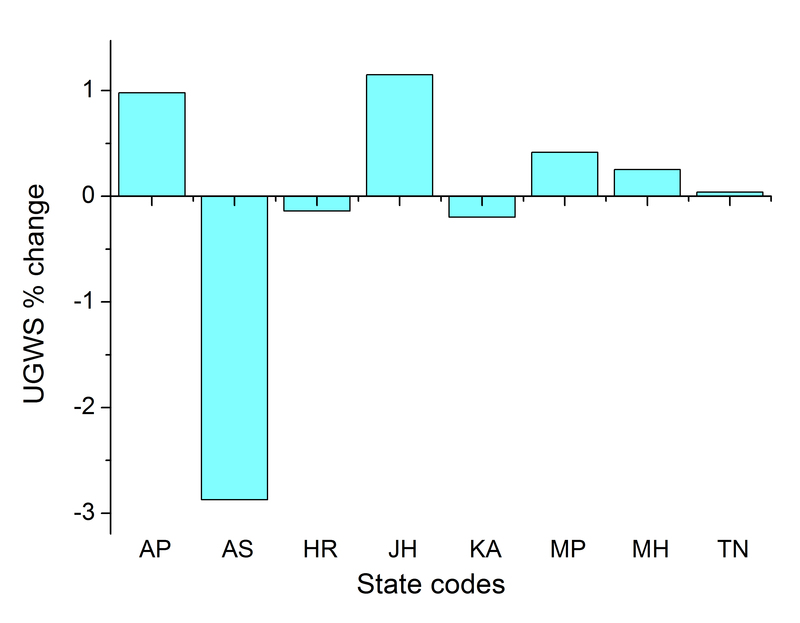 Change in usable groundwater storage during 2005-2013 in Assam (AS), Andhra Pradesh (AP), Haryana (HR), Jharkhand (JH), Karnataka (KA), Madhya Pradesh (MP), Maharashtra (MH) and Tamil Nadu (TN). Graph by study authors. Bhanja, S. N., Mukherjee, A., Rangarajan, R., Scanlon, B. R., Malakar, P., & Verma, S. (2019). Long-term groundwater recharge rates across India by in situ measurements. Hydrology and Earth System Sciences, 23(2), 711-722. Banner image: Rice plantation in Assam. Photo by ICIMOD Kathmandu/Flickr. Mongabay-India is a conservation and environment news and features service that aims to bring high quality, original reports from nature’s frontline in India.